I think a lot of us parents (and kids) are guilty of spending a little more time than is desirable on our gadgets, be that phones, tablets or laptops. 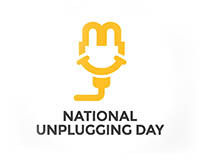 My three kiddies have a lot of love for their iPads and it does at times cause me concern which is why I think National Unplugging Day on the 25th June and pledging to #GoGadgetFree and spend the day from sun-up to sun-down without any technology is such a great idea. I'm not going to lie it will be hard not reaching for my iPhone to mindlessly scan through Facebook or check out Instagram and Twitter but I am willing to give it a go. So who else is with me? If the weather is as sunny as it has been lately, we will be spending a lot of time outdoors in the garden splashing in the paddling pool and having water fights. Another one of our favourite things to do as a family is play board games and the great thing is these can be done inside or out. We have recently been sent a pretty awesome one called Bugs in the Kitchen which comes with a Hexbug Nano who whizzes about a cutlery maze. The aim of the game is to catch the bug in a trap and earn a token each time you do until a winner is declared. It is a very fun game which is great for developing logic and reasoning skills. You throw a die to discover which utensil you can turn and then by turning knives, forks and spoons you can direct the bug into the trap. Check out the video below to see the game in action. The kids have been playing Bugs in the Kitchen for weeks now and are yet to get bored of it, it's fantastic and I have to admit I really enjoy playing with it too. It was easy to set up, first you pop out the cards which the kids did super quickly, you then slot in the plastic cutlery parts to make the maze and you are ready to go. The game is aimed at age 6+ but the twins, who have just turned 4, really enjoy playing it with their big brother Ben who is 7. I have to admit I am seriously impressed with their moves at times and I love watching them figure out their next best move, not to mention the celebrations when the bug is trapped. It is definitely a great game for teaching actions and outcomes. Bugs in the Kitchen by Ravensburger is available to buy at all the usual toy retailers including Amazon, Argos, Smyths Toys and more. Amazon currently have it on sale for £16.98 which is great value so well worth grabbing while you can.